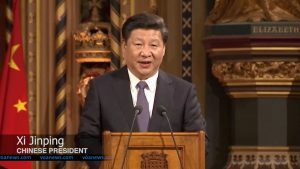 While Chinese President Xi Jinping has declared war on poverty, and instructed local governments to create a “moderately well-off society” by the beginning of 2021, in time for the centenary of the ruling Communist Party, regional authorities are failing to teach ethnic minority groups enough Putonghua [Modern Standard Mandarin], Zhu Weiqun, said in an article in the state-backed Global Times newspaper. Efforts to teach minority peoples Putonghua are “not up to scratch” in various places, said Zhu, who is head of the minorities and religions committee of the Chinese People’s Political Consultative Conference, an advisory body. Understandably, there has been resistance against the push for linguistic standardization in regions such as Tibet and Xinjiang, where Tibetans and Uyghurs, a Turkic-speaking, mostly Muslim minority, consider language integral to their cultural identity. Beijing denies that promotion of Putonghua damages minority culture, arguing that learning the official language gives minorities greater opportunities for work and education. Zhu said in the article that communication issues with workers from Xinjiang could cause a “vicious cycle” when companies group the workers together hindering their ability to work with others. Over 70% of the Chinese population speaks Putonghua, but levels of fluency in west China are 20% lower than in the east, with only 40% of people able to speak the official language in some rural areas, Zhu said. He added that using a standardized form of the language to alleviate poverty, and using poverty alleviation to promote the language “does not only have an economic importance, but also has a deep political importance”. Mandarinization of China, and other countries speaking Chinese languages, has clear advantages, but it should not result in the death of local languages. There are many advantages in maintaining and even promoting “heritage” languages and there are no disadvantages: it promotes bilingualism, which has positive effects on cogntive development (one I am particularly interested in is that it delays dementia), has economic advantages, promoting business activity in the larger regions as well as locally, and gives the younger generation access to the wisdom of their elders. Use of the home language in school makes acquisition of the second language (Mandarin in this case) much easier. It is easier to develop literacy in a language you already understand, and once you can read in any language, it transfers across languages. Also, subject matter knowledge learned in the first language will make instruction in the second language more comprehensible. This has been confirmed in many studies.